Two important parts of horse training are desensitizing the horse and sensitizing the horse. Desensitizing to objects, sounds and places so the horse does not literally fear for it’s life, freak out, and accidentally kill you. Sensitizing to your commands so the horse knows when you are talking to it and asking it to respond in some way. Both pieces are equally important. You don’t want an over-sensitized horse who spooks at every rock, whistle and gesture; nor do you want a completely dull horse that is half asleep and won’t move when necessary. 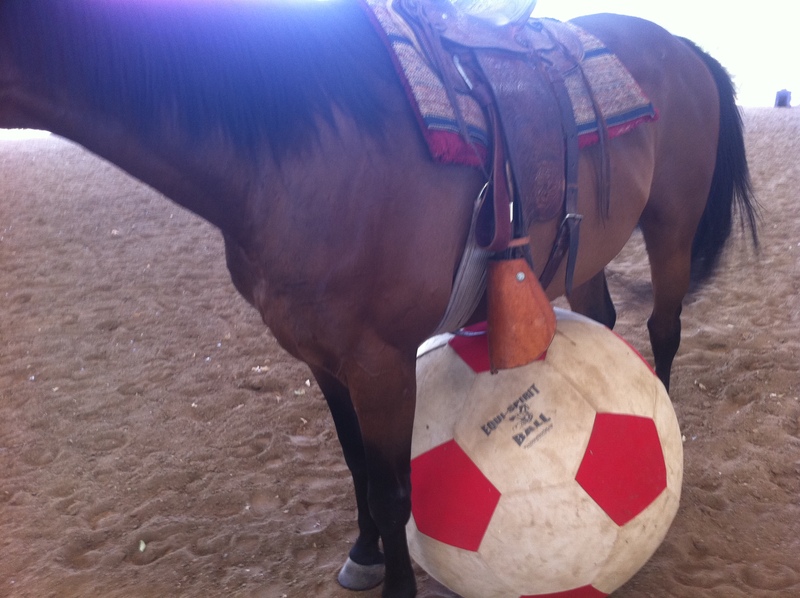 Last week Cowboy and I worked on desensitizing with a giant red and white ball. Cowboy saw the ball as a big round predator. He was anxious and would not stand still when I rolled the ball toward him. Eventually, though, he decided it was worth checking out. After a few more minutes I was able to rub the ball on his legs. 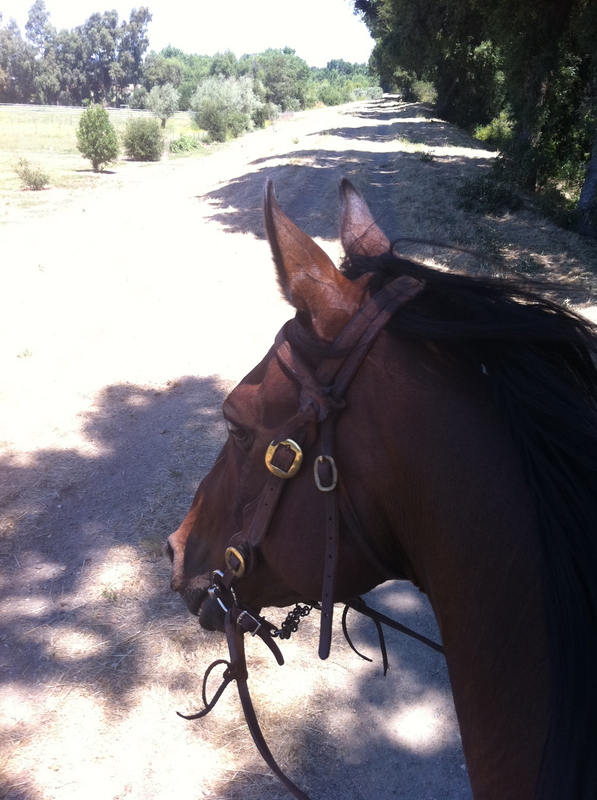 He was skittish and uncomfortable at first, but became more relaxed the more I did it. By the second day of working with this (there’s no rushing a horse), I was able to pass the ball underneath his belly to the other side with no upset. 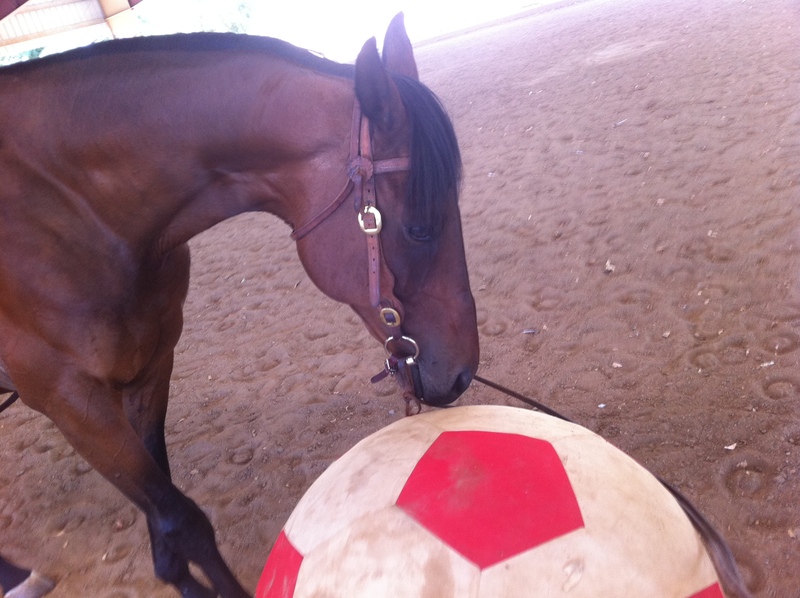 If you have a horse and a ball, all it takes is patience, love and some sweet talking. What if there were de/sensitizing exercises for humans? Well, I believe there are. Having an honest conversation with friend, family or lover. Exposure to new people, places and sounds. Stepping out of routine and comfort. Learning something new: knitting, guitar, French. And of course, meditation and yoga asana practice. Sensitive enough to respond appropriately; desensitized enough to not be alarmed by every new thing. All it takes is self-directed patience and love. A little sweet talking doesn’t hurt. Want to jump right into sensitivity practice? You can download two yoga classes for free. These are live, as in unscripted, there are um‘s and sooo‘s, references to the room, student questions, etc. Practicing along would be a great desensitizing exercise! Both classes start with the story about the horse. Both classes are focused around hip work. Right click the link and “Open with” iTunes. This is a 75 minute, lighthearted, beginner-friendly class. Blanket or towel padding for the knees and blocks (if you have them) will be helpful. This is a 75 minute more intermediate flow class. Blanket or towel, blocks, a bolster or blanket roll, and a golf or tennis ball are all referenced. If you do not have these things, just interpret the poses without them. In any yoga practice, I believe we hit at least 95% of the human de/sensitizing exercises listed above: it’s like a very honest conversation, you’ll probably be out of your comfort zone at some point and you might get completely lost. But, like Cowboy, I hope you aren’t spooked by the shadows and shapes out on the trail. Have a safe ride! I love how you bring your world experiences to the mat for all of us. Kate Z.
kate – that’s so great! thanks for the link — it sounds like something i’d LOVE! i just met dean and michelle at the new barn (we recently moved) who are members too. do you know them? and…. i don’t think i knew you ride… !!! What a lovely post! And yay for classes!! p.s. Did you see the movie Buck? I saw it a couple weeks and thought it was very powerful. Thanks for posting the magic! Hips are feeling good and emotions are definitely feeling unstuck in a good way. Here’s to more audio classes! Michelle, I LOVE this post (especially the free yoga classes).